Let the spectacular alpine scenery be the backdrop of your New Zealand honeymoon adventure. Catering to every budget and many types of activities, Queenstown offers something for many honeymooners, though couples with a strong interest in nature and ecotourism will likely enjoy it the most. Accommodation ranges from backpacker hostels to the most exclusive lakeside oases of luxury. 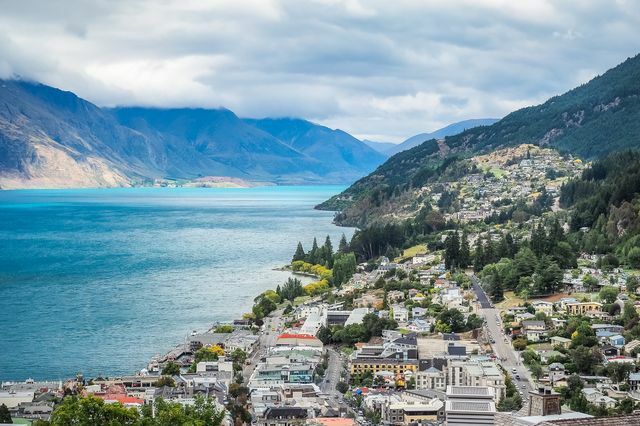 While Queenstown bills itself as “The Adventure Capital of the World,” there are a plethora of lower octane activities for those seeking a more relaxing holiday. The region is a literal land of milk and honey, responsible for a significant quantity of New Zealand agricultural production. Foodies will be delighted with the restaurants offering the innovative creations made with local cuisine or simply enjoying cherries picked that morning and sold from a roadside stall by the farmer’s kids. Those interested in culture and history will enjoy touring historic towns from the early days of New Zealand’s colonization as well as learning about the region’s Maori history and culture. For those looking for the more adventurous and/or extreme, you will be spoiled for choice. The lake and mountains, which dominate the scenery, also are the sites for most of the activities. Options include jet boating, mountaineering, hiking (called “tramping” in New Zealand), bungee jumping, snowboarding, zip lining, etc. Every experience level is welcomed, and those wishing to try something out will find no shortage of instructors. Ready for an adventure? Start planning your Queenstown honeymoon! Queenstown uniquely never has a “low season” due to the excellent variety of activities at all times of the year. During the winter, it turns into a winter sports enthusiast’s paradise for skiing and snowboarding. The pleasant and mild (circa 68 to 75 degree) summer days attract hikers, boaters, mountain bikers, and so on. Despite being perpetually in-season, peak times are Christmas to New Year and New Zealand and Australian “school holidays” (January to February; July). Go for the seasonal activities that suit you! Scenic Flights: Consider a scenic flight around the Queenstown area or farther afield to Milford Sound for the best views possible. Comparison shop the travel agents in town for the best deal. Wine Trail: Oenophiles will love touring the regions vineyards and attending tastings. You can self-drive or charter a car for the day. Jet Boating: For a thrill on the lake, go out on these special speed boats and enjoy the stunt maneuvers. Consider the “Hydro Attack” submersible shark for a particularly unique variant. Arrowtown: This historic town was the site of gold prospecting in the 19th century as well as a filming location for Lord of the Rings. Rent a pan and you might still find some gold. Gourmet Food: Craft beer, wine, specialty Manuka honey, handmade chocolates, fresh local produce, and smoked salmon, to name a few, are readily available and often packaged securely for ease of bringing home through customs if you so choose. Guided Nature Walks: A guide will take you on a tour of the area’s natural and historic attractions. You’ll cover more ground than a typical tourist would on his or her own. Lake Cruises: A number of operators will take groups around the lake and the lakeside towns. One company operates a vintage steamer! Parapenting/Paragliding: The particularly brave will enjoy this unique activity which involves launching yourself off a mountain using a parachute to ride air flows. Tandem Sky Diving: Adrenaline junkie honeymooners can admire the stunning Queenstown scenery as they fall towards it strapped to an experienced sky diver. Spa: Honeymooners in need of R&R can take advantage of a developed spa culture at one of the area hotels or independent spas. Ecotours: More intensive options include a bus-cruise-bus excursion to Milford Sound as well as a tour of the Queenstown area by zip line. Farm Visit: Foreign visitors often enjoy farm tours which include meeting livestock, afternoon tea with fresh scones, and sheep shearing –something of a sport and a unique bit of Kiwiana. Have a look at Walter Peak High Country Farm. Luge: Queenstown’s mountainous terrain is perfect for a luge track, where you control a gravity-propelled vehicle down a track. Looking for thoughts, tips and places to see or go for a honeymoon in Australia and/or NZ. FH and I are taking 2 weeks off for the honeymoon and want to do it right. We'll be going Feb 2015.